Scott Elliott is an Engineer with the Cambridge Fire Department, on the job for seventeen years. He also currently serves as the V.P. for the Cambridge Firefighters Local 910. He has been involved in public safety in the capacity of a volunteer, medic, and firefighter for more than twenty-seven years. 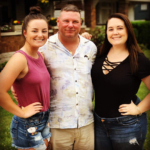 He is married to his wonderful wife Lori and have two beautiful daughters, the oldest, Ericca is a college grad and out on her own, and the youngest, Chloe is a senior at CHS. He also works part time in a local tavern as a bartender, he is very good at listening! He enjoys going to concerts with his family, riding motorcycles, playing golf and especially boating and lake time. Scott and his wife met after both of their first marriages failed and were both picking up the pieces of fractured relationships, hers with a child involved. Scott understands how difficult it can be to deal with relationships with children, being a step-parent (though we do not use that term) and a parent that is not in the home. Our family relationships are first and foremost, but the effects of the job can spill over into home life and affect the ones we hold most dear. Alcohol and substance abuse are prevalent in the fire service and few of us can say that we have not been affected by it. This career takes its toll on all of us, and as a peer supporter, Scott would like to extend his hand to help our brothers and sisters with what is troubling them, to get past the stigma that our mental health is a secondary concern.